This policy brief is one of five commissioned by the Department of Health and Human Services, Office of the Assistant Secretary for Planning and Evaluation on Medicaid eligibility policies for long-term care benefits. This brief outlines the Medicaid rules that affect community spouses of nursing home residents and widows or widowers of deceased nursing home residents. 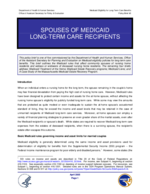 The remaining four briefs address: Medicaid Treatment of the Home; Medicaid Estate Recovery programs; Medicaid Liens; and A Case Study of the Massachusetts Medicaid Estate Recovery Program. When an individual enters a nursing home for the long term, the spouse remaining in the couples home may fear financial devastation from paying the high cost of nursing home care. However, Medicaid rules have been designed to protect certain income and assets for the at-home spouse, without affecting the nursing home spouses eligibility for publicly funded long-term care. While some may view the amounts that are protected as quite modest or even inadequate to sustain the at-home spouses accustomed standard of living, they far exceed the income and asset levels that may be retained in the case of unmarried recipients of Medicaid long-term care services. Moreover, at-home spouses can employ a variety of financial planning strategies to preserve an even greater share of the marital assets, even after the Medicaid recipients or spouses death. While states are required to recover Medicaid long-term care expenses from the estates of deceased recipients, when there is a surviving spouse, the recipients estate often escapes this outcome. Medicaid eligibility is generally determined using the same income and asset provisions used for determination of eligibility for benefits from the Supplemental Security Income (SSI) program -- the Federal income maintenance program for poor elderly and disabled persons.1 However, some states (the eleven so-called 209(b) States)2, 3 employ more restrictive Medicaid eligibility criteria than are used in the SSI program, while certain other states may use more generous rules.4 In addition, when one spouse applies for or receives Medicaid coverage of nursing home care while the other spouse remains in the community, the so-called spousal impoverishment rules5 disregard a certain amount of income for the financial support of the at-home spouse. All income and assets (his, hers and theirs) are combined, regardless of ownership, including things that are often the sole legal property of just one spouse -- for example, retirement savings accounts or pension checks. If either spouse has an interest in property with a legal right to sell, claim or cash it out in some manner to obtain money for his or her personal use, then the fair market value of that property is counted to the extent of the spouses legal right to convert it to cash. In addition, ownership of certain assets does not affect the Medicaid eligibility of married couples. Ownership of assets in excess of those listed above make an individual ineligible for Medicaid. However, the person may qualify at a later date after the excess is depleted, either by spending it down on medical bills or other necessary personal expenses, or by employing various financial planning strategies. Such strategies are more varied and numerous for married couples because they can take advantage of special provisions to protect additional resources for persons separated from their spouses by a long-term stay in a nursing home or other medical institution. In some cases, states extend spousal impoverishment protections to the non-Medicaid spouses of recipients of Medicaid Home- and Community-Based Waiver services.11 However, the law does not extend these protections to couples in which both spouses receive Medicaid long-term care services. Medicaid rules that protect marital assets for the community spouse require that all the couples countable assets are first added together, regardless of whose name appears on the title. From that total, Medicaid subtracts an amount to be retained by the community spouse, plus a small amount (usually $2000) for use by the institutionalized spouse. Any remaining assets must then be depleted in order to qualify the institutionalized spouse for Medicaid long-term care services. The couple may deplete these excess assets by spending them down on the cost of nursing home care or by using them in ways described later in this issue brief. The process begins with a resource assessment in which a snapshot is taken of all countable assets owned by the couple at the time of admission of the ill spouse to the nursing home, even if the Medicaid application is not filed until later. The snapshot does not include assets normally excluded during Medicaid eligibility determination, such as the couples home or personal effects. Either spouse has the right to request the assessment immediately upon admission to the nursing home or at any time thereafter. If the couple does not request an assessment, the State is required to perform an assessment at the time when the institutional spouse applies for Medicaid. Nursing homes must inform all new admissions about the availability and implications of the asset assessment, including those who have not expressed an interest in applying for Medicaid services upon admission. Couples who choose not to be assessed upon admission may encounter problems later on with collecting the necessary documentation to recreate a snapshot of what their countable assets were at the time of admission. When the Medicaid application is filed, the State uses information obtained from the resource assessment to calculate the community spouses share of the couples total assets. The calculation begins by dividing the total assets in half and assigning one half to each spouse. The community spouses half share of the total is then compared to the States minimum and maximum spousal allowance amounts. If this half share is less than the minimum, he or she is allowed to keep more than a half share to boost that protected share up to the minimum level. If the half share of total assets is greater than the maximum allowance, then the share protected for the community spouse is limited to the maximum amount, and he or she retains less than half of the total assets. Once the spousal allowance is calculated, it is up to the couple to work out the allocation of specific assets. The community spouse may be able to retain more than the maximum protected amount by: 1) obtaining a court order for more; 2) requesting a hearing to petition for an amount sufficient to generate income consistent with Medicaid income protection guidelines for spouses;18 or 3) just saying no19 -- i.e., by taking sole ownership of marital assets and refusing to make any of them available to pay for the institutionalized spouses care. In this case, the institutional spouse may be unable to qualify from Medicaid because he or she is prevented from spending down the designated share of the marital assets. However, the State may make a determination of hardship in order to provide Medicaid benefits, or may pursue assets in possession of the community spouse under general state laws regarding marital support obligations. General financial strategies used to shelter assets in order to qualify for Medicaid have been well documented.20 They are legal and particularly amenable for use by married couples who wish to preserve marital assets in amounts greater than those protected for use by the community spouse under the Medicaid spousal impoverishment rules. By using up assets or converting them into another form of equal value that may not be counted when determining Medicaid eligibility, the institutionalized spouse, having retained fewer assets to spend down, may qualify for Medicaid long-term care assistance sooner. In this scenario, the long-term financial prospects of the community spouse may also be improved by eliminating certain future expenses. The general rule is that Medicaid coverage of nursing home and certain other medical care is denied for a period of time if an applicant or his or her spouse transfers asset and fails to receive full and fair market value in return.23 This provision also includes transfer of the individuals home, an asset normally excluded in determining Medicaid eligibility. The State penalizes uncompensated or inadequately compensated asset transfers occurring as far back as 36 months before a Medicaid application is filed (60 months for assets transferred into a trust). The penalty begins when the transfer takes place -- a time that may precede the persons admission to a nursing home and/or filing of a Medicaid application. The penalty period is equivalent to the number of months of nursing home care that the transferred assets could have paid for at the private-pay rate. Medicaid rules on asset transfers between spouses, or to a third party for the sole benefit of one spouse, are more complicated. They allow such transfers without penalty and without limits. Yet, if either spouse transfers assets to another party without receiving fair market return, the institutionalized spouse stands to lose Medicaid coverage of nursing home care. By using marital assets to pay bills prior to applying for Medicaid assistance, the community spouse can reduce demands on the assets he or she is allowed to keep under Medicaid spousal impoverishment rules. The couple may elect to pay off existing debts; to prepay real estate, insurance, or other large bills; or to prepay funeral expenses. As explained above, Medicaid eligibility rules do not count certain assets such as a home, a car, or personal effects. Therefore, a spouse might be advised to take money from countable savings to buy a more expensive home; repair or improve an existing home; or buy a new car, new household furnishings, or personal effects. Medicaid rules do not restrict conversions of countable assets into non-countable ones of equivalent value. Unlimited amounts of money can be spent on non-countable assets for the community spouses use while getting Medicaid to pay for long-term nursing home care. Some strategies are designed to convert assets into income or an income equivalent for use by the community spouse. In order to avoid a Medicaid penalty or compromise coverage for the institutionalized spouses long-term care needs, the community spouse must receive something of equal value in exchange for the transferred assets. Applying this concept to specific Medicaid cases may require considerable financial sophistication. It may be difficult both for states to be consistent in the way they address this issue and for elderly people and their financial advisors to accurately anticipate the Medicaid consequences of such asset exchanges. The confusion is exacerbated by numerous, varied and constantly evolving conversion strategies, which are also widely used in retirement planning for purposes unrelated to Medicaid long-term care. Annuities are an increasingly popular conversion strategy. They are contractual arrangements in which an individual pays a lump sum, which may be from general savings or retirement accounts such as an IRA or 401(k), to receive a future stream of income in return. They are offered in a bewildering variety of forms by commercial financial entities, and often are associated with poorly understood consequences and costs to the consumer.24 Medicaid annuities are heavily advertised on the Internet and presumably are designed to avoid potential Medicaid pitfalls. Couples anticipating the need for long-term care for one spouse can protect unlimited assets by using them to buy an annuity that names the non-Medicaid spouse as beneficiary.25 Although savings are immediately and substantially reduced, the community spouses income is increased by a more modest but recurring amount. The at-home spouse can either spend that income or reinvest it, effectively recouping most of the assets used to purchase the annuity. Medicaid rules require the annuitys return to be commensurate with a reasonable, actuarially sound estimate of the life expectancy of the annuity beneficiary.26 Annuities failing this test may result in a finding by the State that an uncompensated asset transfer has occurred, which triggers a penalty in the form of denial of Medicaid coverage of long-term care benefits for the institutionalized spouse. The duration of the penalty is based on the portion of the promised stream of income that is beyond the individuals predicted life expectancy. Medicaid requires states to recover expenses for Medicaid financed long-term care services from the estates of persons who received these services after they reached age 55 or who, regardless of age, were determined by the state to be permanently institutionalized.29 The major exception to this general rule is that estate recoveries are prohibited during the lifetime of a surviving spouse.30 However, states have the authority to recover from the estate of the recipients widow or widower, although many of them defer such recoveries or waive them altogether.31 Further, states that do recover from the estate of a surviving spouse may elect to impose a lien on the home to protect the States right to be informed and make a claim against the home upon his or her death. A Medicaid claim on behalf of the recipient may only be made on the estate of the surviving spouse if that estate includes countable assets. However, states may not interfere in any way with use or disposal of property, including the home, during the lifetime of the surviving spouse, who may freely spend it, sell it, or give it all away without concern for a Medicaid claim.32 Of course, this freedom from Medicaid financial consequences ends if the surviving spouse also applies for Medicaid, at which point he or she becomes subject to Medicaid rules and penalties for transferring assets without receiving a fair market return. Medicaid rules are designed to protect sufficient income and resources for the community spouse of a nursing home resident to avoid undue hardship, without compromising the institutionalized spouses ability to qualify for Medicaid long-term care services. Sufficiency, institutional bias, and equity are three areas of concern to address in evaluating how well these rules accomplish their admirable goals. On the matter of sufficiency, some would argue that the rules do not protect enough and that community spouses are well advised to exploit every legal financial strategy to shelter additional income and assets. Others argue that these opportunities should be limited so that Medicaid, a program for the poor, can target its funding toward people with even greater financial needs. On the matter of institutional bias, spousal protections are primarily available only when one spouse enters a nursing home. This may encourage couples to choose nursing home care in lieu of home- and community-based services, even though most couples would prefer to remain together in their own home. Although access to such services is more limited than access to nursing home care in many communities, the cost of care for the ill spouse in the community may be considerably less. On the matter of equity, it is reasonable to ask why Medicaid gives special income and asset protections to some, but requires others (couples living together or persons without living spouses) to be impoverished before they can qualify for long-term care assistance. How these concerns will be addressed in the future, and at what cost, remains to be seen. SSI rules on income and assets are described in Title 20 of the Code of Federal Regulations at: http://www.access.gpo.gov/nara/cfr/waisidx_02/20cfr416_02.html. For income, see Subpart K, beginning at section 416.1100. See especially section 416.1160 on deeming of income support between spouses. For resources, see Subpart L, beginning at section 416.1201. Detailed rules are in the SSA Program Operations Manual System, Sections SI 008 and SI911 at: http://policy.ssa.gov/poms.nsf/poms?OpenView&Start=1&Count=50&Expand=5.4t. Groups Deemed to be Receiving SSI for Medicaid Purposes. Technical Assistance Series for Medicaid Services to Elderly or People with Disabilities. Disabled and Elderly Health Programs Group. Center for Medicaid and State Operations. June 12, 2002. Disability and Aging TA Series #01 at: http://www.cms.hhs.gov/medicaid/eligibility/ssideem.pdf. Access state-specific information from the State Medicaid plan for each state at: http://www.cms.hhs.gov/medicaid/stateplans/. They are Connecticut, Hawaii, Illinois, Indiana, Minnesota, Missouri, New Hampshire, North Dakota, Ohio, Oklahoma and Virginia, according to: Kassner, E. and Shirey, L. Medicaid Financial Eligibility for Older People: State Variations in Access to Home and Community-Based Waiver and Nursing Home Services. Report No. 2000-06. AARP Public Policy Institute. April 2000 at: http://research.aarp.org/health/2000_06_medicaid.pdf. Section 1902(r)(2) of the Medicaid statute permits states to use less restrictive income and resource methodologies in determining Medicaid eligibility. Federal guidance is provided at: http://www.cms.hhs.gov/medicaid/eligibility/elig0501.pdf. Obtain state-specific information from individual state Medicaid plans at: http://www.cms.hhs.gov/medicaid/stateplans/. Section 1924 of the Social Security Act; U.S. Code Reference 42 U.S.C. 1396r-5. Kassner and Shirey. April 2000 at: http://research.aarp.org/health/2000_06_medicaid.pdf. Regulations on the recipients post-eligibility share of cost are in Title 42 of the Code of Federal Regulations, Chapter 435.700, Subparts H and I at: http://www.access.gpo.gov/nara/cfr/waisidx_02/42cfr435_02.html. Detailed guidance is found in Chapter 3 of the State Medicaid Manual at http://www.cms.hhs.gov/manuals/45_smm/sm_03_3_toc.asp. See Sections 3700-3714 for overall rules, Section 3628.2 for post-eligibility rules as they affect the medically needy eligibility category, and Section 3590 as they affect individuals in Home and Community-Based Waiver programs. The Medicare Catastrophic Coverage Act (MCCA) of 1988 (P.L. 100-360) added Section 1924 to Title XIX of the Social Security Act at: http://www.ssa.gov/OP_Home/ssact/title19/1924.htm. Detailed Federal guidance is in Chapter 3 of the State Medicaid Manual at: http://www.cms.hhs.gov/manuals/45_smm/sm_03_3_toc.asp. See Sections 3260-3263, 3702, and 3710-3714. "Spouse" is defined under the law of the state of residence. Chapter 3 of the State Medicaid Manual, Part 3261.1. Chapter 3 of the State Medicaid Manual, Part 3710. The spousal allowance is increased by one third for every minor or adult dependent child, or certain other dependents who live with the community spouse. The amount of income the institutionalized spouse can transfer to such dependents is reduced by any income they have in their own right. Stone, J.L. Medicaid: Eligibility for the Aged and Disabled. Report to Congress. Congressional Research Service. Library of Congress. updated July 5, 2002. See Table 7. Chapter 3 of the State Medicaid Manual, Part 3713-4. Note that "spousal impoverishment" rules on income apply post-eligibility but not in determining eligibility. As a result, income intended to be set aside for the community spouse is not set aside when determining the eligibility of the institutionalized spouse (See Section 3261.1 of the State Medicaid Manual). This may cause some institutionalized spouses to have too much income to qualify for Medicaid, though not enough to cover the cost of care and support of the community spouse. There is no data on whether or how often this hypothetical outcome actually occurs. These are described at: http://www.srskansas.org/services/DivisionofAssets.htm. States are permitted to use the so-called income first rule, which limits the amount of additional resources that the community spouse may petition for to an amount commensurate with current income, including income transferred from the institutionalized spouse. If the income of the institutionalized spouse disappears at death, assets owned by the community spouse alone may not be able to maintain his or her income at its previous level. This state policy option has been confirmed by the Supreme Court in Wisconsin Department of Health and Human Services v. Blumer at: http://supct.law.cornell.edu/supct/html/00-952.ZS.html. A synopsis of this decision is presented at: http://www.oyez.org/oyez/resource/case/1446/. For a discussion about determining the amount of assets necessary to produce a given amount of monthly income, see: http://www.elderlawanswers.com/resources/s7/r33487.asp. A simple description of just say no or spousal refusal is at: http://www.elderlawanswers.com/resources/s8/r33572.asp#9. Note that the just say no strategy is only successful if the State does not pursue legal action against the community spouse to recover the assets. For an overview of financial planning techniques used to bypass the standard Medicaid rules, see Burwell, B. and Crown, W.H. Medicaid Estate Planning in the Aftermath of OBRA 93. The Medstat Group. August 1995. For information on protecting the home from estate recovery, see Goldfarb, D. The Homestead and Medicaid Planning at: http://www.seniorlaw.com/homestead-medicaid.htm. Elder law information on Medicaid viewed in the broader context of estate planning is at: http://www.elderlawanswers.com/resources/s8/r33572.asp. Advice for both laypersons and attorneys is provided by Budish, A.D. (1995). Avoiding the Medicaid Trap: How To Beat the Catastrophic Costs of Nursing- Home Care. Henry Holt & Company. State-specific advice for attorneys and financial planners is widely available on the Internet. Walker, L., Gruman, C. and Robison, J. (1998). Medicaid Estate Planning: Practices, and Perceptions of Medicaid Workers, Elder Law Attorneys, and Certified Financial Planners. Gerontologist 38(4): 405-411. Curry, L., Gruman, C. and Robison, J. (2001). Medicaid Estate Planning: Perceptions of Morality and Necessity. Gerontologist 41(1): 34-42. For general Medicaid rules on transfer of assets, see the State Medicaid Manual, Chapter 3, Part 3258. For asset transfers between spouses, see Parts 3252, 3258.10 and 3262.4. Annuities are analyzed, with ample attention to consumer cautions and potential negatives consequences, at: http://www.efmoody.com/insurance/insuranceoverview.html. A report by state Medicaid directors identifies annuities purchased for non-Medicaid spouses as a particular problem area. See Coates, A., Deily, M. et al. The Role of Annuities in Medicaid Financial Planning: A Survey of State Medicaid Agencies. Prepared by the Annuities Work Group of the Eligibility Technical Advisory Group of the National Association of State Medicaid Directors for the American Public Human Services Association. October 2003. at: http://nasmd.org/Annuities%20Workgroup%20Product_October%202003.pdf. Federal Medicaid guidance on annuities is provided in Chapter 3 of the State Medicaid Manual, Part 3258.9.B at: http://www.cms.hhs.gov/manuals/45_smm/sm_03_3_3257_to_3259.8.asp#_3258.9. Federal guidance on life estates is in Chapter 3 of the State Medicaid Manual, Part 3258.9. Federal rules are wary about attributing cash value to care-giving services by family members that would be given out of affection and without expecting compensation, in the absence of Medicaid rules. The rules defer to states on what constitutes acceptable documentation. See Chapter 3 of the State Medicaid Manual, Part 3258.1.A.1. Section 13612 of P.L. 103-66 imposed the Medicaid estate recovery mandate by amending Title XIX of the Social Security Act, accessible at: http://www.ssa.gov/OP_Home/ssact/title19/1917.htm. Detailed Federal guidance to states is in the State Medicaid Manual, Chapter 3, Section 3810 at: http://www.cms.hhs.gov/manuals/45_smm/sm_03_3_3800_to_3812.asp#_3810. Note that Medicaid recoveries take place within the context of state property and inheritance laws, and are influenced by options chosen by each state to define the scope of its Medicaid recoveries and implementation methods. States are also prohibited from recovering if there is a surviving child who is under age 21, blind, or permanently disabled, and in certain cases where an adult child or sibling lives in the deceased recipients home. Only 9 of 34 states responding to one study reported always collecting from the estates of surviving spouses. See Table 6 of the report prepared for the AARP Public Policy Institute by Sabatino, C.P. and Wood, E. Medicaid Estate Recovery: A Survey of State Programs and Practices, September 1996. This was confirmed in a recent court case. See Nevada Department of Human Resources v. Estate of Ullmer (120 Nev. Adv. Op. No. 16. April 1, 2004) at: http://www.leg.state.nv.us/scd/120NevAdvOpNo16.html.